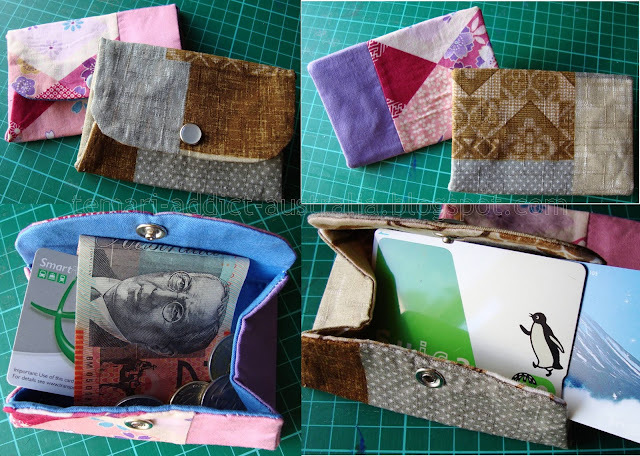 Dairy Free Chocolate Cake and Coin purses. The cake was for Miho's birthday. The recipe made A LOT of batter, I made mini cupcakes so the kids didn't eat too much cake and poured the left over batter into a round cake tin. I didn't test the round cake with a skewer and it ended up being a little undercooked (well moist anyway) which reminded me of fudgey brownies. We heated a slice up with ice-cream for dessert. Yum! I almost slipped into a diabetic coma! Handy to hold a few notes and coin at the bottom of your beach bag, gym bag or to put your bus/train swipe card into, these coin purses are kind of cute. Actually I think these would also make a great orts container when stitching out and about. I used fabric scraps from my stash and the snaps I purchased last week to make these. They are really easy and fun to make, I really liked adding the snaps... there was something rather satisfying about bashing the heck out of the setting tool after a few very parentally frustrating days. Also it's much better to whack the snap than snap and whack the kid... don't you think? The first one I made with patchwork patterned fabric, but the other was pieced together and then cut to the pattern shape. Note the Suica and Mt Fuji phone card in the bottom right image?? Yep I am all ready to travel on the JR system too bad the reality is the smart card for the Perth transport system... a girl can dream though!! !